Sure, I remember the Disney movie TRON . Loved it — thought it was one of the coolest movies around. Yes, it stars one of the girls who appeared in Caddyshack (heh). With the new TRON Legacy movie getting good reactions to the preview making the rounds, maybe this Halloween is a good time to make your own TRON costume using electroluminescent wire? Sonja Thompson posted a "how to" on TechRepublic in August, so I’d start there. Pretty good step-by-step report. 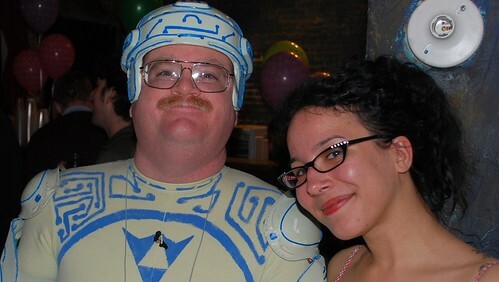 Yes, it features "Tron Guy" Jay Maynard, who has gained a fair amount of notoriety in geekdom. “Electroluminescent (EL) wires are really the best option. When you use the LEDs, you have to put them in one at a time, and it takes a while. You can make them react to sound, or make different patterns with them,” said Diana Eng, a fashion designer and author of “Fashion Geek: Clothes, Accessories, Tech” (North Light Books, 2009). “It’s pretty easy to use. All you need is some AA batteries,” Eng said. EL wire is regular copper wiring coated in a colored sheath that glows when current runs through the wire. Essentially a very long LED, you can weave it through your costume to add highlights, or give it a futuristic touch, Eng said. By soldering EL wire to a controller, users can program the wires to blink in rhythmic patterns, or respond to sensor input like motion or sound. The stuff’s made by LyTec, with distributors worldwide. Try Live Wire in New York. This entry was posted on Friday, October 29th, 2010 at 7:58 am	and is filed under Cool Stuff, Front Page. You can follow any responses to this entry through the RSS 2.0 feed. You can leave a response, or trackback from your own site.